Calling the Scarred Province home, Brutus are hefty creatures with a low center of gravity. 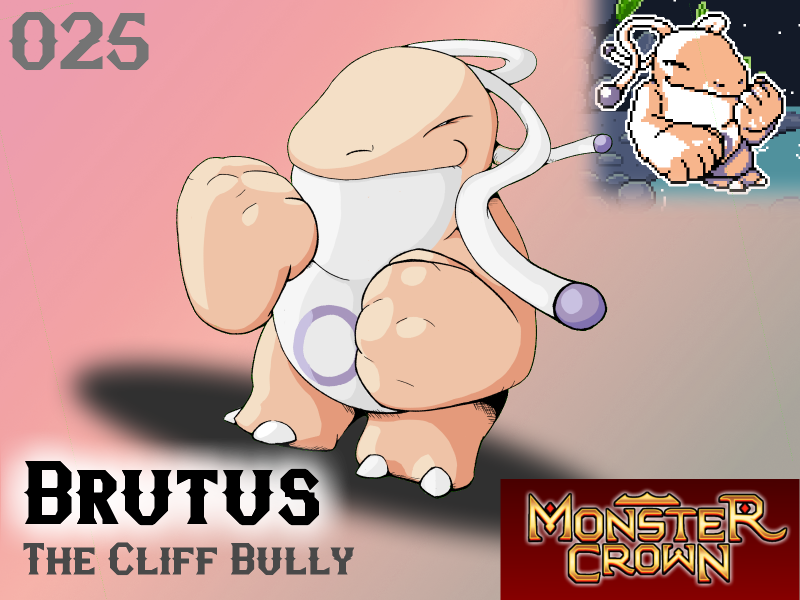 Brutus's fists are blunt, causing their punches to exert an even pressure on contact. While the punches themselves rarely cause serious injury they can knock an enemy monster into the distance. When threatened Brutus will stomp its feet, inflate its frog-like throat and emit a loud droning noise from its nostrils. Posed to attack, it will weave back and forth looking for an opening to land a punch in order to cast the foe from the cliffs and into their doom. Brutus have been known to eventually become cocky after a chain of victories. This over-confidence has occasionally lead them to challenge a Traumata, a deadly mistake that will not offer the opportunity to learn. Will Brutus make your team?